On 1-3 August 2012, the implementing partners for project consortium 1 on ‘Delivering new sorghum and finger millet innovations for food security and improving livelihoods in eastern Africa’ held its monitoring and review meeting in Eldoret, Kenya to discuss the overall progress, achievements and related challenges in the course of the implementation of the consortium project as well as on how best the project consortium team can utilize the remaining time and resources to execute the planned project activities. The monitoring and review mission involved technical presentations by all project team members that was later followed by visits to the project sites run by Moi University, a partner in the consortium. In attendance were implementing partners from Addis Ababa University (AAU-Ethiopia), Makerere University (MUK-Uganda), Moi University (MU-Kenya), Maseno University (MSU-Kenya), Michekoni Agricultural Research Institute (MARI-Tanzania), Ethiopia Institute of Agricultural Research (EIAR), and International Crop Research Institute for Semi-Arid Tropics (ICRISAT-Nairobi). The Program Management Team (PMT) together with Jacob Mignouna, a member of the technical advisory committee (TAC), were present to participate in the project review activity as part of the monitoring and evaluation exercise the Program Management Office (PMO) is currently conducting for all Bio-Innovate’s consortia projects. 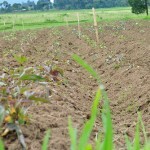 Since the start of the project in January 2011, the consortium partners from Ethiopia, Kenya, Tanzania, and Uganda have been evaluating and promoting the adoption of drought and disease tolerant sorghum and finger millet varieties that are resilient climate change in eastern Africa. The major achievements made by the consortium project so far in terms of sorghum innovations include: (i) 58 elite sorghum lines, selected from trials conducted in 2011, were planted in various drought prone areas in Kenya, Tanzania and Uganda for further selection; (ii) 13 elite sorghum lines were screened for Al tolerance in various acid soil sites (pH 4.1-5.5) in Kenya and Tanzania; (iii) 3 stay green sorghum lines were planted in northern Ethiopia and are currently being evaluated for drought tolerance in collaboration with local farmers (iv) new stay green QTL mapping populations were advanced to F2 and parental polymorphism screening completed (v) 6 elite sorghum lines were planted in Kenya for further selection for P tolerance; (vi) 17 elite Striga tolerant sorghum lines were planted in Kenya and Uganda for further selection; (vii) more than 50 elite sorghum lines, selected from the 2011 trials, were planted in Uganda for further screening for tolerance to anthracnose; (viii) 116 entomopathogenic fungal isolates, mostly from genera Metrahizium and Beauveria, against sorghum chafer were collected both from the field and different institutions in Ethiopia and screening for the most virulent isolate(s) is in progress; (ix) 6 sorghum chafer traps from local materials assembled and the efficiency of different combinations of semiochemical compounds as well as their release rates were determined; (x) 15 anthracnose/TLB resistant sorghum varieties have been developed. 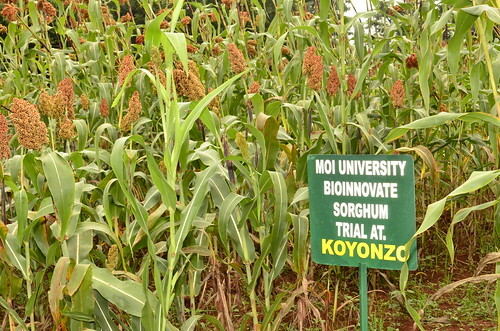 A Moi University sorghum trial site in Koyonzo Busia county, Kenya (Photo credit: Bio-Innovate-ILRI/Albert Mwangi). 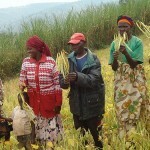 The finger millet component of the consortium project is also making encouraging progress and recorded the following milestones: (i) 3 aggressive blast pathogen strains were isolated; (ii) 772 finger millet accessions have been planted in Uganda, Kenya, Tanzania and Ethiopia for drought screening; (iii) 375 accessions have been planted in Kenya and Ethiopia for blast screening; (iv) 746 accessions have been phenotypically characterized in Uganda, Tanzania and Ethiopia and the preliminary results indicate the presence of wider morphological diversity among than within the finger millet landraces collected; (v) 801finger millet accessions have been genotyped for Uganda, Kenya, Tanzania and Ethiopia using 20 SSR markers; (vi) new SSR markers have been identified using next-generation sequencing technology and 181 of these are being validated. (vii) 30 F1 progenies have been developed and are being advanced to F2; (viii) more than 38 blast tolerant and 52 susceptible genotypes were identified and advanced for further evaluation; (ix) more than 24 drought tolerant genotypes were identified and advanced for further evaluation in drought prone areas, (x) 10 crosses between wild and cultivated finger millets have been developed; (xi) value chain analysis for finger millet has been done and data analysis is in progress. 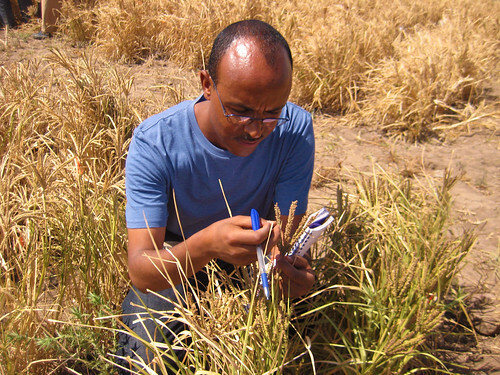 Kassahun Tesfaye a co-principal investigator from Addis Ababa University in one of the finger millet trial sites in Ethiopia (Photo credit: Bio-Innovate-ILRI/Albert Mwangi). The consortium is engaging farmers in participatory variety selection, an inclusive approach aimed at training farmers on selection of superior varieties with desirable characteristics while allowing them to be part of the variety selection process. In consultation with other stakeholders, the consortium is also in the process of developing a tool for value chain analysis and existing seed systems for these orphan crops. In addition to the field activities, 4 research scientists from Ethiopia, Uganda and Tanzania were trained at ICRISAT in the use of SSR markers for the genetic characterization of finger millet germplasm. These researchers are now well equipped to use SSR technology within their own institutions in their home countries as well as in the region. They were also able to establish strong collaborative ties within this Bio-Innovate project, which should facilitate future regional collaborations, within and beyond this project. Jacob Mignouna presented his observation on the progress made by the consortium. In his review, he noted that there was good progress overall in the implementation of project activities. However, the reporting of some technical issues needed improvement. He also noted the importance of capturing lessons learned in the reports as part of the learning process. More focus was needed on the socio-economic issues with regard to value chain analysis, he opined. The team was also encouraged to publish their results as the consortium was generating a lot of information from their research activities. “There is good progress in attaining the objectives of the project. However, the team needs to seek external expertise for example from project consortium 9 on ‘Biosciences innovation policy consortium for eastern Africa (BIPCEA)’ for their policy and market analysis component.” Jacob advised. “In addition, the team should revisit and rework their logical framework to reflect what is achievable in the remaining timeframe,” he added. He also advised the team to report only what they can verify, enhance communication between the partners, leverage their work with organizations conducting research on sorghum and millet in the region and find ways of registering germplasm identified and developed by the project. The group also had a discussion on intellectual property rights with respect to envisaged output from the consortium. On its part, the PMT when providing it’s assessment of the progress took cognizant of the fact that the project activities commenced later than the original date due to seasonal and institutional related challenges. Evidently, the overall achievements are laudable and there has been an improvement in the rate of fund utilization. The PMO requested the consortium improves the quality of technical reporting by submitting a detailed and synthesized consolidated report that reflects the progress and achievements as noted during the review meeting. In addition, it was agreed that the consortium should revise their work plans while focusing on what was deliverable within the remaining project period. A sorghum farmer examines the seeds for diseases and pests resistance in his field (Photo credit: Bio-Innovate-ILRI/Albert Mwangi). To ensure delivery of the proposed innovations by the consortium, PMO advised the partners to put more emphasis on team cohesion, communication, and coordination when implementing their activities, areas that needed improvement. PMO also advised the team to improve on information and germplasm sharing and emphasized that the partners should work to ensure that the regional nature of the project is accentuated. The team was requested to be proactive in submitting reports and responding to PMO’s queries. On financial accountability, the PMO reiterated that financial statements were to be accompanied by supporting documents, there should be adherence to institutional procurement procedures, and the partners to state their procurement plans for the next fund disbursement request and provide evidence of matching funds from other stakeholders with corresponding breakdown of fund utilization. The team promised to send a clear financial report for the bi-annual reporting period ending June 2012 as required. 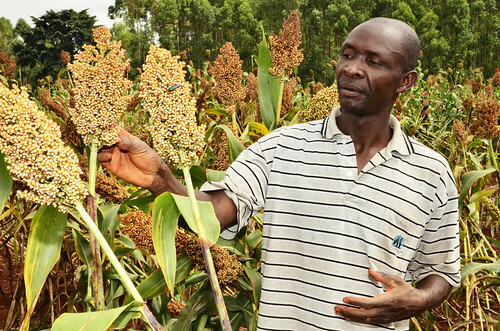 Project consortium 1 aims at delivering sorghum and finger millet technologies that reduces climate change effects, raise productivity and increase income of sorghum and finger millet producing farmers through development-oriented research in eastern Africa.